A few weeks ago I shared my Mom's floor standing jewelry chest makeover. 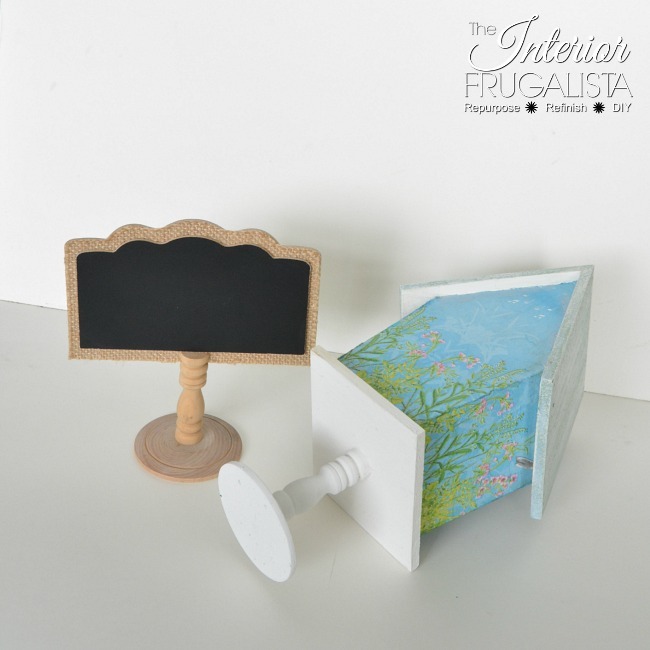 Remember how I decoupaged the sides of the drawers with napkins? If you missed it, you can see the post here at Jewelry Chest Makeover. 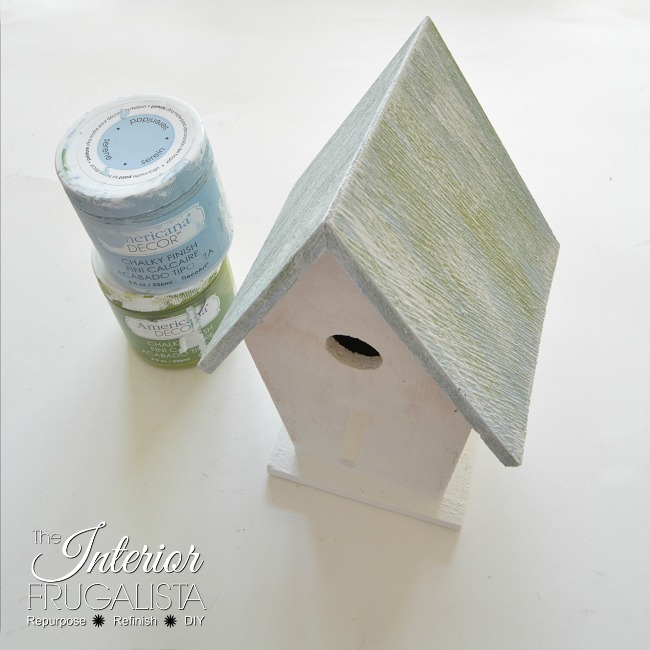 I enjoyed the process so much I decided to try it again except this time on a simple dollar store birdhouse. It all started when I went shopping at JYSK to buy bedding for my grandson's new toddler bed at Grandma & Grandpa's house. I barely got inside the doors when I noticed a display of pretty Summer napkins. I bought two packages, one to use at the dinner table and the other to decoupage onto something, eventually. Then I remembered the birdhouse sitting all naked on our DIY Potting Bench. 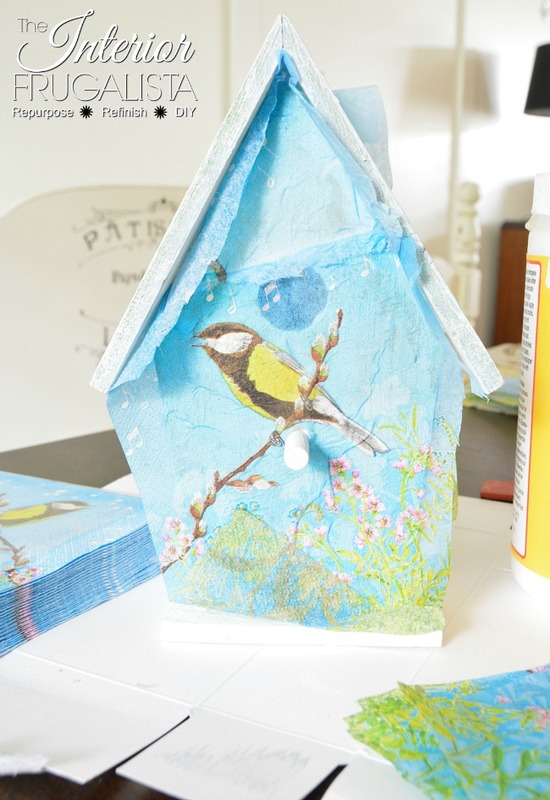 You can see what the birdhouse looked like before and these are the pretty napkins I used to transform it. Painting the roof with layers of color is so easy. Start with a base layer of Everlasting white. Dip just the tips of the paint brush into the color Serene blue and with light pressure apply long random brush strokes. Repeat the previous step with the color New Life green. Before adding the napkins I painted the walls with Everlasting white. Most napkins are 3-ply and you will need to separate and remove the two bottom layers of paper. See how the bird lines up with the perch? Line up the paper how you want it and with scissors cut a small slice to slide the perch through. Cut the napkin a little larger than the birdhouse (as pictured below). 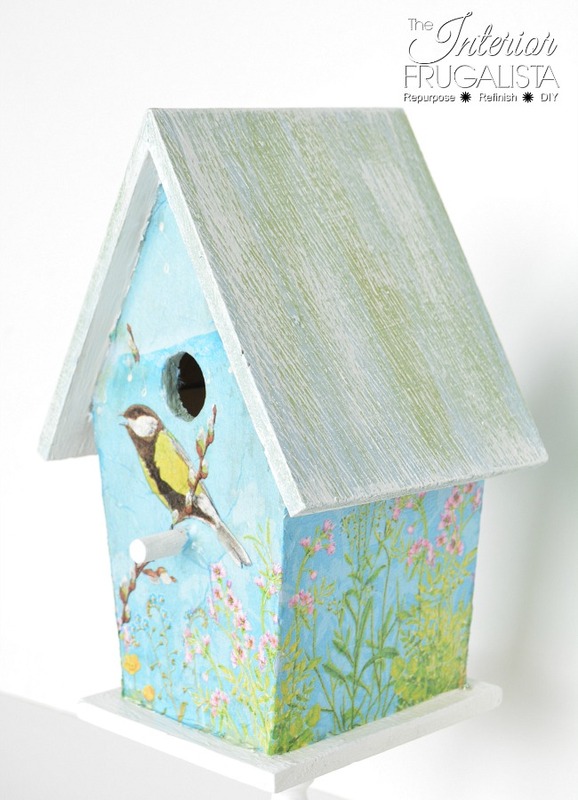 Apply a thin but generous coat of Mod Podge onto the face of the birdhouse. Line the napkin up and let it gently fall onto the birdhouse. The less you handle the paper with your fingers, the better. In the areas that don't have good contact, with very light pressure dab with your finger. NOTE: A reader informed me she places her hand inside an inexpensive plastic baggie to gently pat the napkins smooth. Don't worry about wrinkles, it adds character. You can see my napkin wasn't large enough to completely cover the front and so I cut a smaller piece of napkin and repeated the same process as above. Continue the same process on the back and sides of the birdhouse. Once the decoupage is dry, trim the excess paper with a sharp retractable razor knife. If the blade is dull you risk ripping the paper. Of course, safety is key during this step - take your time and be very careful. NOTE: A reader informed me that using a nail file also works by pulling the file down the sides and across the edges. After you've trimmed the paper, gently use a fine sandpaper or a nail file to smooth any rough edges. Apply 1-2 generous protective coats of Mod Podge over the paper. The key is to generously load the foam brush and don't go over the same area twice or you risk tearing the paper. Let it dry and repeat for the second coat. I also applied a coat of Mod Podge onto the roof to protect the paint finish. I had just the base of a dollar store chalkboard sign leftover from my daughter's wedding. 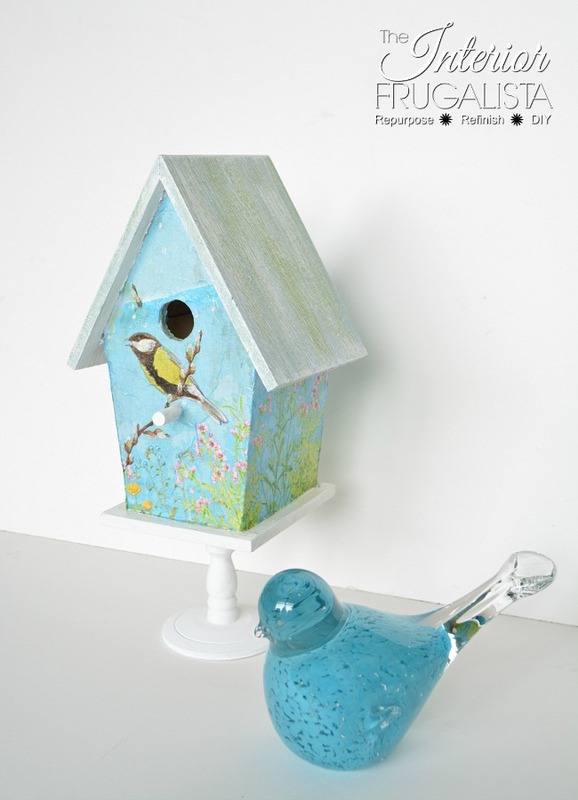 It was perfect to use as a pedestal base on the birdhouse. I attached it with Gorilla Wood Glue and once cured I painted it the same Everlasting white color. You can see what happened to the top half of the chalkboard sign here in my post Rustic DIY Wedding Ideas. You'll find it hanging from my grandson's neck. 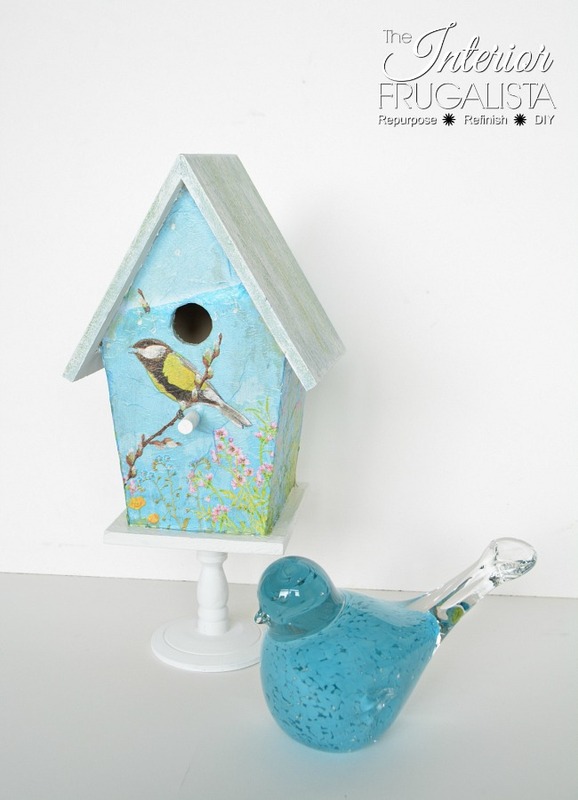 I think the birdhouse looks so pretty and can't beat the price of a whopping $3 to make it. 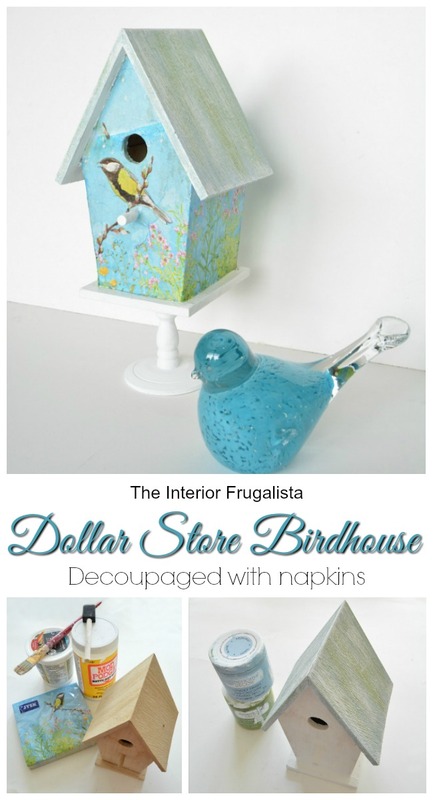 If decoupaging with napkins is something you'd like to give a try, please save my birdhouse makeover on Pinterest and/or share it with a friend. 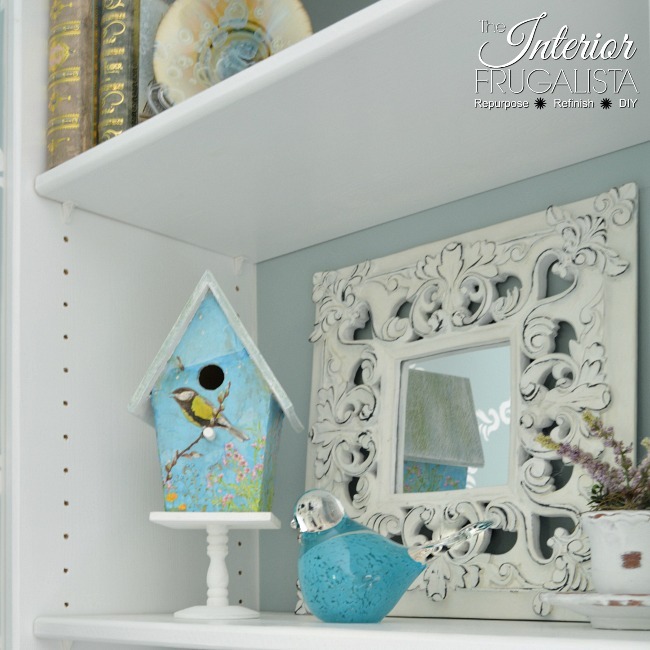 If you've been following my blog for any length of time you know how much I love using birdhouses in seasonal vignettes. 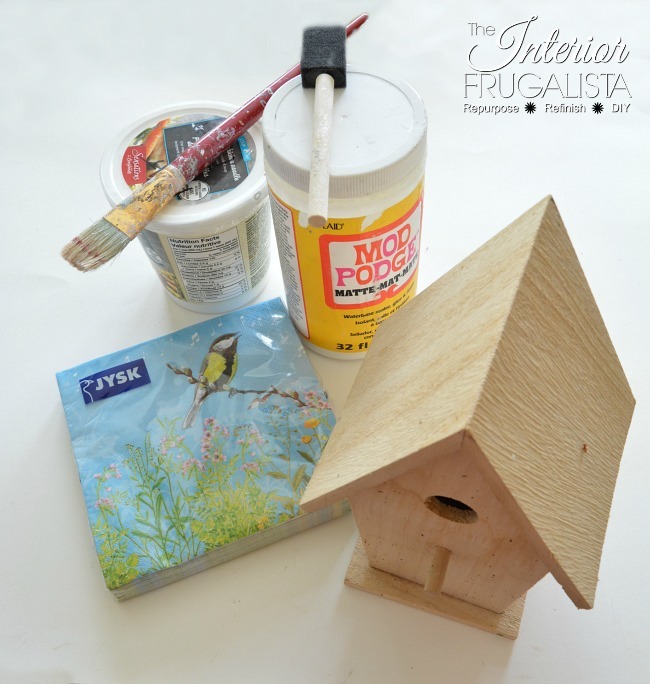 Remember the Pedestal Birdhouses for under $5 I made for the master bedroom? I used this birdhouse to create another vignette.